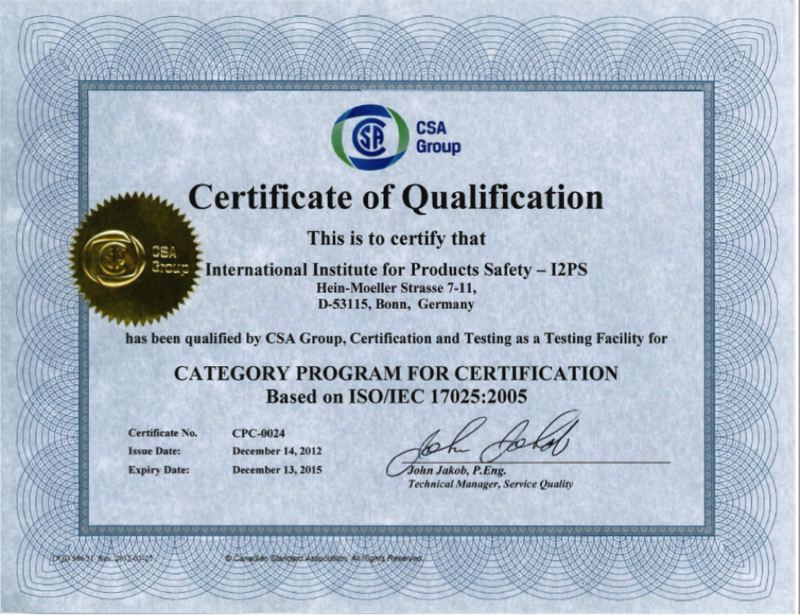 I2PS GmbH is recognized by a large number of certification bodies, with this recognition being based on the company's national accreditation in conformity with DIN EN ISO/IEC 17025. This accreditation is granted by the German National Accreditation Body (DAkkS) on behalf of the German Federal Government. The appendix to the DAkkS certificate lists all the standards for which the I2PS GmbH Test Laboratory Bonn is accredited and is available for download through our Downloads Center. As part of I2PS' re-accreditation in May 2013, we were granted greater flexibility so that we would be able to use versions of standards deviating from those stipulated in the accreditation scope. This means that we are allowed to use newer versions of standards than those specified in the scope without this requiring a new assessment. The associated list is available for download through our Downloads Center. 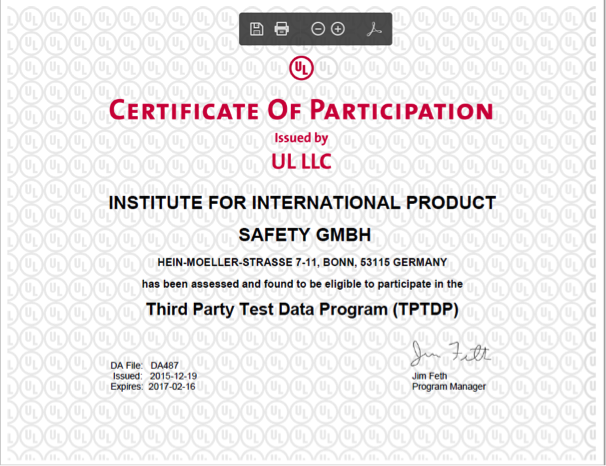 At the Institute for International Product Safety GmbH, we can help our customers gain worldwide access to markets, which requires an extremely broad range of product certifications. This recognition is based on the accreditation granted by DAkkS in conformity with DIN EN ISO/IEC 17025. This certification system (CB Scheme, where CB stands for "certification body") is recognized in 48 countries. It is based on the reciprocal acceptance of test reports and certificates from the corresponding national certification bodies (NCBs). Certification bodies that work together with laboratories are part of the scheme (CB Scheme Scope). Within the context of the CB Scheme, I2PS works together with UL International DEMKO A/S. 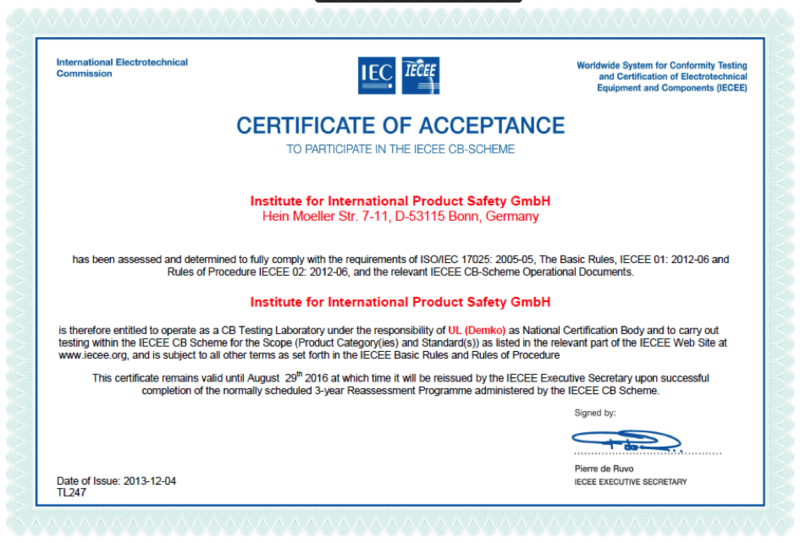 UL-DEMKO is UL's certification body for IEC standards (UL-DEMKO CB Scope). 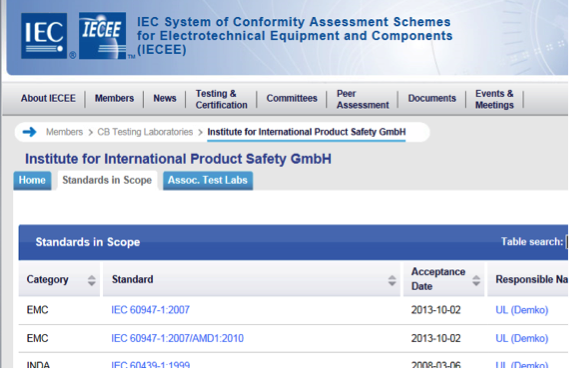 The CB system is based on IEC standards. However, not all countries have incorporated the latter into their body of standards the same way. Accordingly, the IECEE website lists country-specific deviations. Within the context of the CB Scheme, standards are subdivided into various product categories. I2PS works in the POW (Low voltage, high power switching equipment), INDA (Industrial Automation), and PROT (Installation protective equipment) categories. The rules that make up the CB Scheme are published in a variety of documents, some of which are publicly accessible through the IECEE website. Other documents are intended exclusively for internal use by testing laboratories and certification bodies, and it is strictly prohibited to disclose them to third parties (Nat. Differences, TRFs). UL LLC (Underwriter Laboratories Limited Liability Company) is a well-established certification body in North America. I2PS has been working together with UL LLC for many years now. As of this writing, I2PS participates in the TPTDP (Third-Party Test Data Program) within the context of DAP (Data Acceptance Program). UL recognizes tests from the following CSA, IEC, and UL standards performed at the I2PS testing laboratory. UL recognition refers to the listed tests from these standards. The exact scope of this recognition can be gathered from the TPTDP Scope. The Canadian Standards Association (CSA International) recognizes I2PS in the Program for Certification (CPC) category. 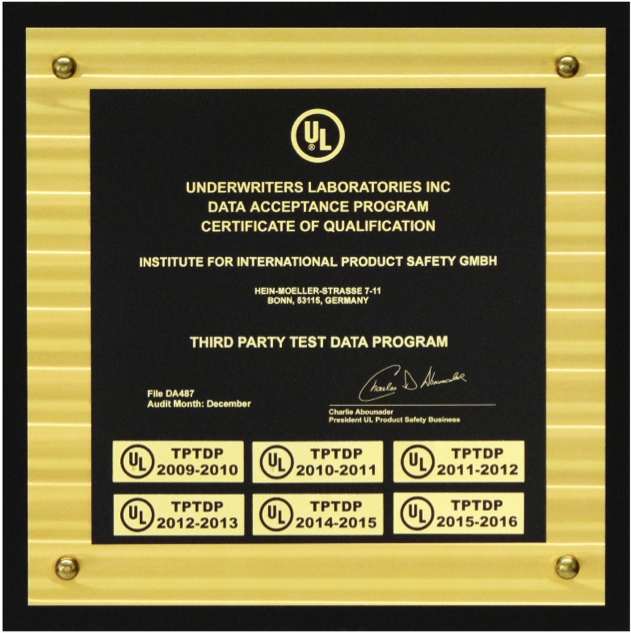 I2PS' technical test results are recognized by Middle Eastern countries or through the company's cooperation with UL (Underwriters Laboratories). Testing for Middle Eastern countries is based on IEC standards, as well as additional requirements stipulated by the relevant national standards institutes and/or responsible utilities. 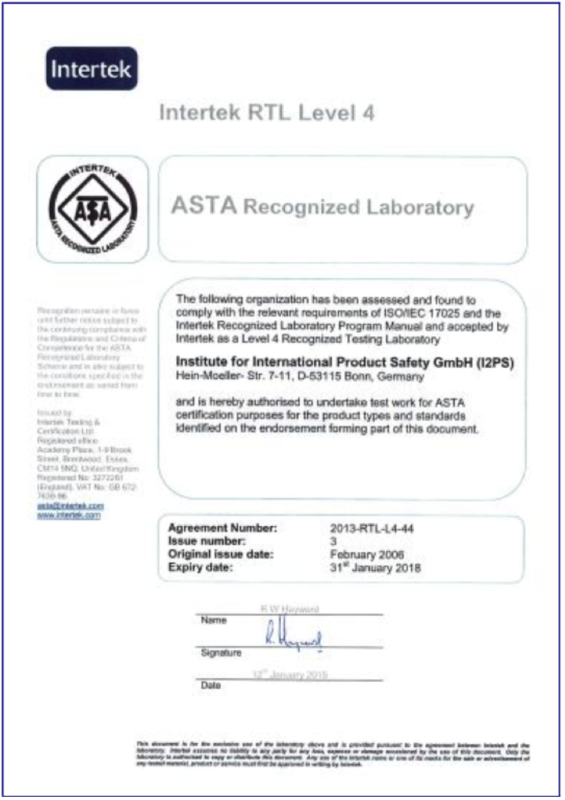 Intertek ASTA has recognized I2PS as an ASTA Recognized Laboratory within the context of the ASTA Recognized Laboratory Scheme. When performing tests, standard-specific ASTA BEAB Decisions, as well as ASTA BEAB Laboratory Handbooks, need to be observed. 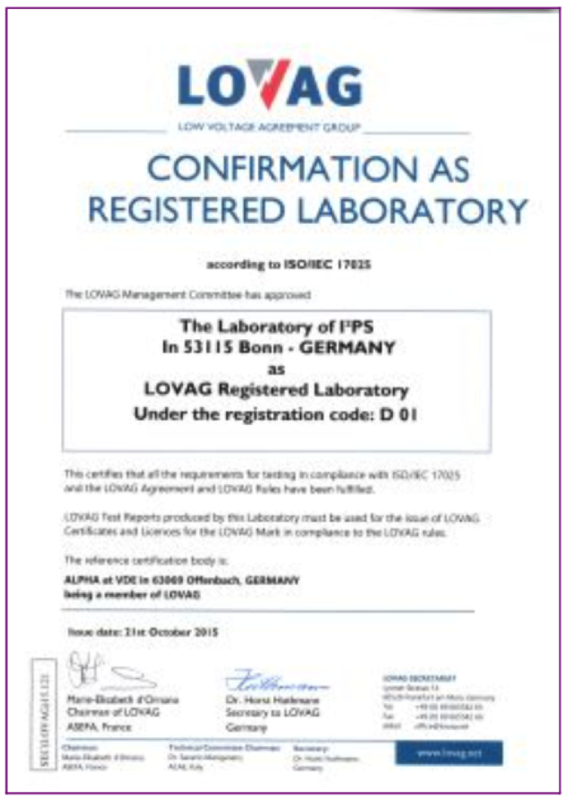 LOVAG recognizes I2PS as a testing laboratory, meaning that I²PS test reports can be used to prepare LOVAG certificates. I2PS is recognized by all major classification societies. Tests for shipping classification are performed in conformity with the applicable product standards and the classification societies' specific requirements.